No Way, Jose? Yes way, Delmon Young. Delmon Young: poised to be the next Jose Bautista? STRADER: It’s what every great, and not so great, sportswriter wants to do. The killer prediction. The real one. No, for all those who have tried it, the New York Yankees are going to win the World Series is not a prediction. Shut up. The Arizona Diamondbacks are going to win the division is a prediction. (Props to Sports Illustrated’s Dr. Z on the greatest prediction of all time – Giants over Patriots on Feb. 3, 2008 ­– now that’s a prediction). They’re the one nobody sees coming, the one that makes you look like a sports genius. A swami, shall we say? Prior to the 2009 season, I named my fantasy baseball team, Jose Bautista?Really?? I’m not going to sit here and tell you that I predicted 54, 124, .260, .378, .617. Nobody did. But it was a prediction. I saw something in his bat during his September run and thought to myself, this guy’s gonna make this team. He’s going to win a starting job and play regularly, Cito obviously loved him. Maybe he’ll hit 25 and 85 and surprise a lot of people. I figured him to be another Wendel Clark. Toronto great, you know? Not quite great, but best in town, so ring of honour and ticker tape parade. Arguable best player in the game though? Nobody saw that out of Jose. And now, as he backed up one of the best offensive seasons in baseball history (Yep, I’m a steroid era hater – all hail Ken Griffey Jr. The real Barry Bonds. Yeah, we all know it Barry) with 43, 103, .302, .447 and .608 our resident King of Toronto has become the subject of one of the best of the present day baseball off-season predictions. Who is the next Jose Bautista? His name is Delmon Young, and I believe he is the next Jose Bautista. Granted, Young isn’t going from 15 HR and 54 RBI to 54 HR and 124 RBIs the way Jose did, because Delmon’s already had a great year. 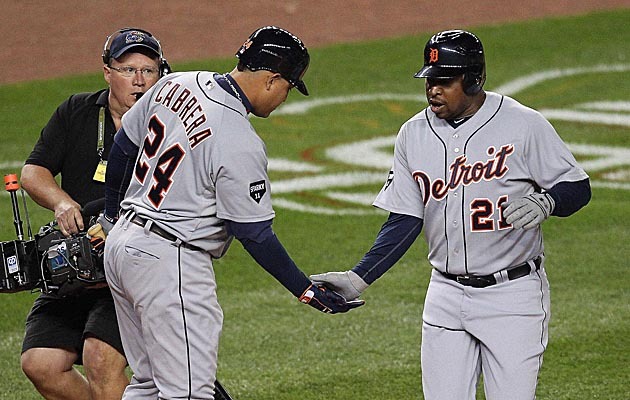 21 HR in the majors is great, I don’t care what anyone says, and 121 RBIs is ridiculous, but there’s another step for Delmon. That’s what he was supposed to be, and much like we all just watched with Alex Gordon, I think health, maturity and a consistent spot in a talented lineup is going to boost Delmon to the kind of player who can be counted on for 35-40 HR’s and 100+ RBIs every year. He has to work on that strikeout rate, that can come with age, and experience. Jose did it at 29. Gordon was 27 last year. Delmon will be 27 this year. Everybody knows who Delmon Young is. But after 2012, he’s going to be one of those guys everyone wants to draft. LIVINGSTONE will offer his selection for breakout player of the year in Cincinnati Reds OF Jay Bruce. Stay Tuned.